Enter your name and details now! We respect your privacy, and hate spam as much as you do. your details will NOT be shared with any third party. Imagine being able to add over £500,000 to the bottom line performance of your Dealership in just the next 12 Months without spending an extra penny on marketing! Well, even in the current market conditions it can be done! Understand your "First Kill Ratio" and why it might be "Killing Your Business"
Plus, you also discover how to convert as much as 60% of the AMBER WORK from your VHC and have your customers love you for it! So pop your details in the boxes on the right, I will get your report to you, and feel free to e-mail me with your questions and feedback. 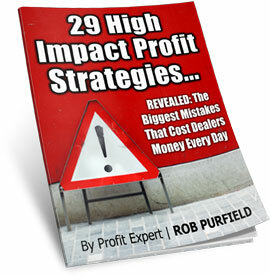 Rob Purfield, the U.K.’s Number One Automotive Profit Consultant and author of the book "The Ultimate Knockout Closing System." P.S. This report deals with real life strategies to improve your performance immediately and is a must for anyone serious about making a profit in a Motor Dealership. Studio 2, Greenacres, Park Lane, Cottingham, HU16 5RX. Tel: 01482 661177 Company No 6769888.